Reader Debbie (okay, yes, she's my sister) sent in this great tip to me. We have not tried the product but think it is so unique that it is worth exploring. "Maggie’s Soap Nuts are the only laundry soap that grows on trees! Truly effective, 100% natural and safe for your most sensitive skin. 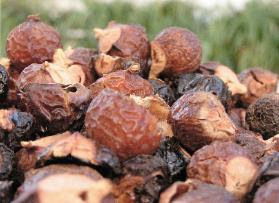 Soap Nuts are the dried fruit of the Chinese Soapberry tree. it in your laundry. Your clothes come out clean, vibrant, and soft. and your planet will thank you." The website also explains how to use them and other FAQs. After washing with the nuts you can compost them. I think they sound very interesting and want to try them just to see how they work. I'll be sure to let you know how it goes! I'd be interested to know how these do with cloth diapers, both on how well they clean and if they affect absorbancy at all.